At least I think she is ... Ella is our 1 year old Lab mix. What type of mix, well that's a great question. Her paper work from the Cincinnati SPCA say she is a Lab/Retriever mix. But her body style suggests more of a lab/hound mix ... maybe Hungarian Vizsla or Greyhound, we are not really sure. What we are sure of is that Ella has brought lots of joy and fun into our life. Life with a dog is really interesting. A dog is always there for you ... they don't get mad at you, they don't hold a grudge against you, they don't look at you and wish you were reading their mind, all of these things make a dog a great companion. A dog really only needs a few simple things to be happy in life ... some good food a few times a day, fresh water in the bowl to slop up and spill all over the floor and a little room to stretch their legs every now and then. Dogs don't really ask for much, maybe a scratch on the belly every now and then, maybe a toss of the ball for him or her to chase in the back yard on a nice day. If you are a dog owner, you'll get this post. If you're not a dog owner, then maybe it's all just a bunch of words to you, but if you have an interest in being a dog owner, then maybe you'll consider adopting a dog. There is a lot of work in raising a dog .. but they are lots of fun! I'm glad you asked ... Rabbit Hash is a tiny river town in KY, that has a dog for it's mayor! That's right, Junior, a black lab was elected mayor of this town back in 2004. Over 3,000 people voted for this playful pup. Junior is known for his public appearances where you can offer him a shake of the paw or even a scratch behind the ear! Now you see it's not just Junior that makes this town so unique. The General Store is celebrating over 175 years in business. So you can just imagine all the "characters" that have walked in & out of this great shop! 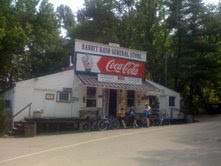 The store offers many authentic Kentucky items and Rabbit Hash memorbilia. They even list several 'barn dances" on the event calendar whero locals gather to stomp their feet to some real authentic country & blue grass music. The afternoon we rode through, a guy was setting up a huge grill to throw on some hot dogs and burgers to sell to patrons that frequently stop by this gem of a town. It's not only a popular spot for cyclists, it also ranks high on the list of stops for many motorcyclists traveling though these beautiful KY roads. If you ever find yourself in Rabbit Hash, take a little time to check out this unique town. Pull over, stop off and say hey to Junior, the Mayor, and visit the General Store for some really great people watching and relaxing time along the Ohio river. Junior's owner reports that the lovable black lab has passed away. Just 2 days shy of his 13th birthday, Junior died on May 17th. I learned that in 2006, Animal Planet aired a special about Junior and his life as Mayor of Rabbit Hash. Below is a pic of the new road bike I'm riding this year. This awesome bike was a Christmas gift from JJ and it's a great ride. It's made by the Specalized company and it is the entry level road bike in the women's design. The Dolce provides a smooth, comfortable ride and like any road bike, has several gears to use to work through as you're riding up those long hills! My biggest ride this summer will be participating in the MS 150 Bike Ride. This is an annual ride that raises money for the MS Society. The course starts and ends in Lebanon, OH and follows a "figure eight" loop. I'll be riding 150 miles, over a 2 day period - 75 each day, to raise money for this great organization. My goals is to finish the 75 miles each day, although there is the option to ride 50 miles each day, instead of the 75. Did I set this up correctly? Welcome to my corner of the world wide web, a place for me to write about what's happening in my life. Some of the things I'll be blogging about will include my new interest in cycling and my 2nd year riding in the MS 150 Bike Ride this July. Others areas I'll be posting about include the many projects I have going on around the house and the crazy, fun times we have with our 1 year old pound puppy named Ella. So, thanks for stopping by and I'll be posting more soon!